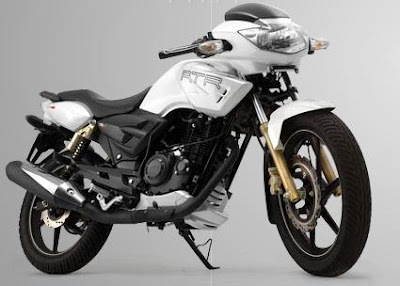 TVS Motors has launched the Apache RTR 180 bike which boasts itself to be an 180cc performance bike which is available at an affordable rate and this time it is reported to launch ABS version of the same. It is believed that the TVS Motor Company has already showcased its Apache RTR 180 motorcycle at the Jakarta Fair in Indonesia. The TVS Company has attracted the crowd with its new model of TVS Apache RTR 180 ABS. The company also launched the Apache RTR 180 attached with an ABS system at New Delhi and with that it is going to be launched in India by Feb. 2011. 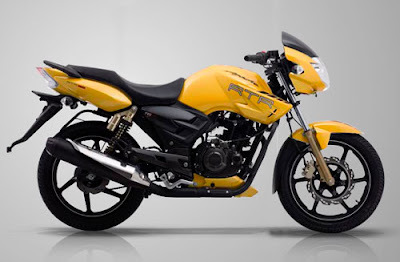 The TVS Apache RTR 180 ABS price tag is Rs. 80,000 inclusive of an additional charge for ABS version. TVS Apache RTR 180 ABS has a sophisticated hydraulic ECU (Electronic Control Unit) with speed sensors. The speed of the wheels is continuously monitored by the speed sensors. The HECU from the bike alters the hydraulic pressure of the breaking system that prevents the locking up of wheels. Thus it enhances the rider’s safety. TVS Apache RTR 180 has another important feature of ‘Rear Wheel lift-off Protection’ (RLP) which prevents the rear wheel from lifting off the road surface when applying a panic braking system and it releases its front brake pressure when the RLP senses the rear wheel lifting off the ground thereby keeping the rear wheel on the ground. The company has developed RLP in association with Germany’s Continental AG company. Germany’s Continental AG has the chassis control systems which has made it popular and has technical partners with renowned brands like BMW Motorrads. It has also other feature such as switch on/off ABS facility. TVS Apache RTR 180 has the other specification like 4 stroke engine with 177.4cc and a single cylinder. It generates a maximum power of 17.3 PS at 8500 rpm and 15.5 Nm at 6500 rpm as its maximum torque. It has 125km/hr as its maximum speed. It has got Telescopic Fork with 105 mm stroke as its Front Suspension and Mono tube inverted gas filled shocks with spring aid as its rear suspension. Its Chassis Type is a double cradle synchronic stiff. It has dimension of 1100mm in height, 2085mm in its length and 730mm as its width. It has a wheel base around 1326mm. it has a Ground clearance at 180mm and saddle height of 790 mm. its front tyre which is tubeless has a size of 90/90x17 inches and its rear tyre which is also tubeless has 110/80x17 inches as its size. It has a 270mm petal disc break as its front break and 200mm petal disc as its rear break its has 137 kg as its kerb weight with fuel tank capacity of 16 liters and 2.5 liters as its reserve.The ABS with all these special features is definitely going to capture the rider’s eyes. So let’s wait and watch.